Organisation Cetacea (ORCA) is a UK based marine charity dedicated to surveying and protecting whales, dolphins and porpoises (cetaceans) in north east European waters. Started in 2000, the charity has two aims, the first to collect sightings data on cetaceans and the second to raise awareness of these incredible animals, the threats they face and what is being done to protect them. Scientific surveys are conducted by volunteers on ferry routes from the UK once a month, with Wildlife Officers present on two routes during the summer. 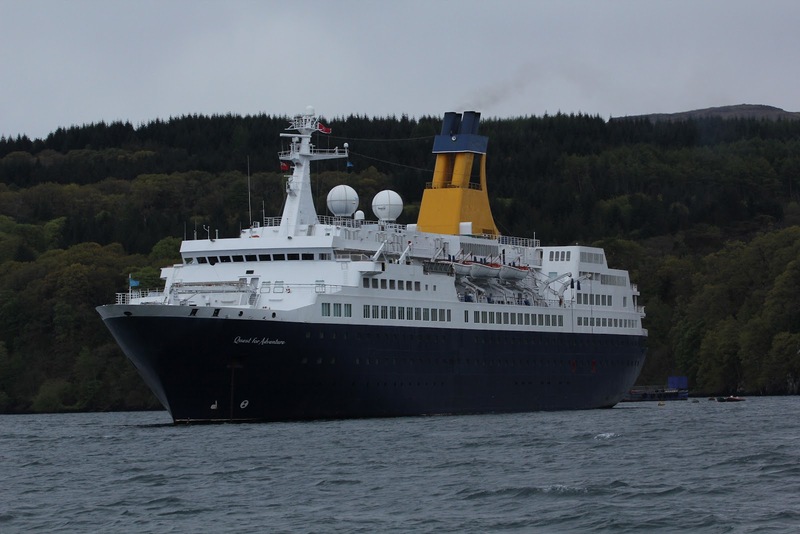 Since 2007 these have been supplemented by surveys conducted on the cruise ship the Spirit of Adventure, with teams heading out on trips up to Scandinavia and Iceland, around the British Isles and down into the Mediterranean. In 2012 a new chapter to this story began, with teams now being placed aboard the Quest for Adventure. The inaugural cruise to Ireland, the Isle of Man and Scotland took place in May, with Lee and I on board as the survey team. Weather conditions ranged from wet to sunny and sea states of a flat calm Force 0 to a wild Force 8, gusting to 50 knots, fortunately while we were in harbour! The ship headed out from Southampton, to Dublin, then to Londonderry, on to Tobermory on the Isle of Mull, and back down to Douglas on the Isle of Man. From there we travelled to Cork, onto St Peter Port on Guernsey and finally back into Dover. 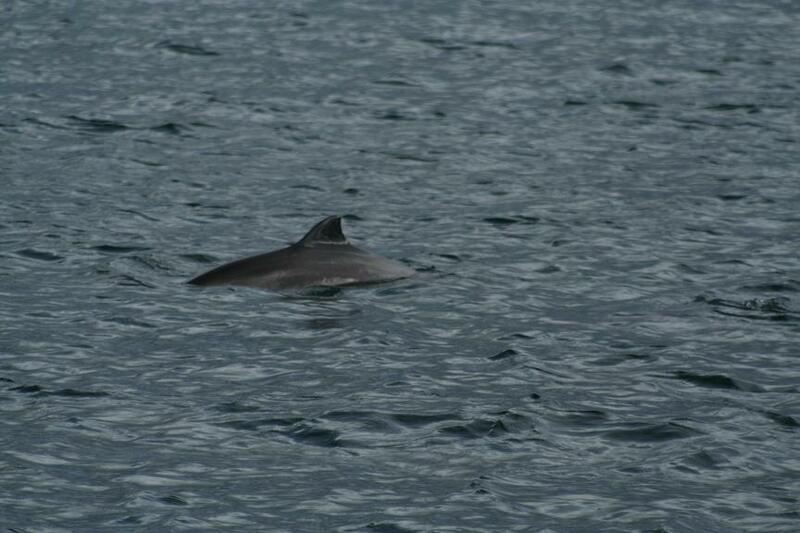 Whilst we did not perhaps pick up as many sightings as we had hoped, with our efforts around Mull and the Isle of Man hampered by choppy seas, we did have seven sightings of harbour porpoise, one brief sighting of two common dolphins and a sighting of three bottlenose dolphin. In the meanwhile there were plenty of birds to keep us entertained, including a white-tailed eagle on Mull, whooper swans heading away from Londonderry and whimbrel flying over the Solent as well as feeding along the shoreline on the Isle of Man. Seabirds abounded, with the usual suspects including manx shearwaters, gannets, guillemots, razorbills, kittiwakes and ‘terns’ dashing across our bow. 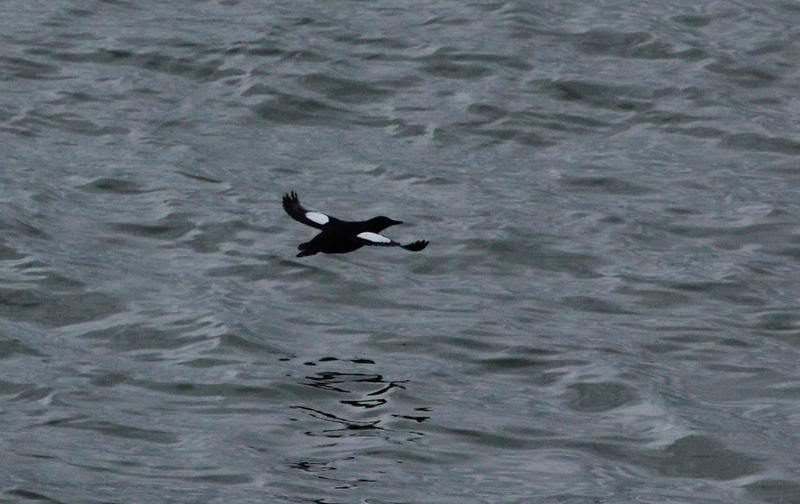 Another highlight was the black guillemots, dazzling with their beautiful black plumage, white wing patches and bright red legs. Although a tiring trip with just the two of us, we did speak with a lot of people, saw some wonderful places and caught up with friends at Sea Life Surveys who gave us a delightful, if rather damp trip out of Tobermory which produced the eagle sighting and an inquisitively close harbour porpoise.